The age of the woman is the SINGLE strongest determinant of success in IVF (and in fertility in general). We know it isn’t fair, but there’s nothing you can do about it. It is, however, a reason to bite the bullet and get on with treatment. Waiting for a year or two is not going to help. It is known that if you are over 36 and have not become pregnant after 6 months of trying, there is an 80% chance that you will require assistance to become pregnant. Females are born with all their eggs and like all body cells, aging effects the quality of these eggs. For conception to happen, consideration must be given to the age of the female eggs, which in turn relates to the quality of the embryo after fertilization. Although research is still being undertaken in the area of age and its effect on male fertility, it appears that the sperm from older men can have a higher degree of DNA damage when compared to that of younger men. It is also thought that age factors in the male may relate to chromosomal and behavioral problems in children. How can female age affect the chance of a pregnancy? Infertility and miscarriage in older women is also thought to be related to the embryo’s energy supply. In every kind of cell, in almost every type of living thing, energy is produced by tiny structures called mitochondria. When an egg is fertilized, the embryo receives all of its mitochondria from the mother. As the fertilized egg divides, so do the mitochondria. However, since all your baby’s mitochondria comes from the egg, which is as old as you are, the mitochondria can fail to produce enough energy for the embryo to divide normally. If the embryo runs out of energy, there can be failure of the embryo to implant or an early miscarriage can result. In some instances there can even be failure of fertilisation taking place. The reason for this may be that the Zona Pellucida (the outer shell of the egg/embryo) becomes hardened in older women. This can make it more difficult for the sperm to get into the egg to fertilize it and more difficult for the embryo to “hatch out” or implant in the uterus and establish a pregnancy. 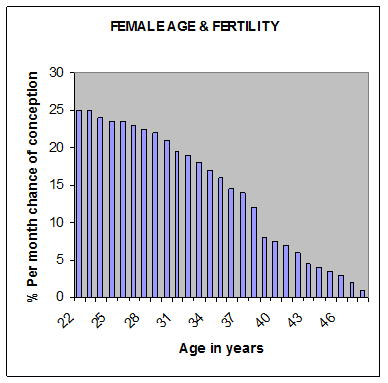 The graph below clearly illustrates how fertility declines with female age. At Fertility Solutions, your Fertility Specialist and nurse will look at your individual case to discover the most likely reason(s) for you not becoming pregnant and at the same time assess your chances of conceiving. A treatment that might be suggested is Intra Uterine Insemination (IUI), where specially prepared sperm from your partner or a donor is placed inside the uterus around the time of ovulation. Another treatment is In Vitro Fertilisation-(IVF), where eggs and sperm are collected and fertilization takes place in the laboratory with an embryo (fertilised egg) being transferred back to the uterus. As it is the condition of the eggs that usually limits an older woman’s fertility, these treatments might not always be appropriate. In such cases, some couples consider using egg donation. In Australia, a sister or close friend usually donates the eggs. For hardening of the shell surrounding the egg (known as the zona pellucida), a procedure called “assisted hatching” may be recommended. This involves using a laser to make a tiny hole in the zona pellucida. It has been suggested that after this procedure, it may be easier for the embryo to “hatch out,” a process which usually requires a lot of energy by the embryo. There are many & varied reasons why pregnancy becomes less likely as women approach the age of 40. Some female conditions can decrease fertility, such as endometriosis or fibroids. Below are some common conditions associated with advancing female age. Endometriosis is a common condition where the endometrium (lining of the uterus) grows in other places, such as the pelvic cavity. This can cause problems in various stages of conception and early pregnancy. Fibroids are benign “tumours” in the muscular wall of the uterus. The closer they are to the cavity of the uterus, the more likely they are to disturb reproduction, either by miscarriage or infertility. If you are diagnosed with one of these conditions, it could explain your difficulty in becoming pregnant, Your Fertility Solutions Sunshine Coast Specialist can treat them. Depending upon your circumstances, the treatment can be with drugs, surgery, or with assisted conception. Miscarriages are much higher among older women. The majority of early miscarriages are due to chromosome disorders. One of the most common disorders is Down’s syndrome. This condition is caused during the final development of the egg. As a follicle matures to produce an egg, a series of cell divisions takes place. Each time the cell divides, each cell receives exactly the same number of chromosomes. This ensures that all the necessary genetic information is passed on. If the egg receives the wrong number of chromosomes, an abnormality can develop. Down’s syndrome is a result of an extra copy of chromosome 21 occurring during that division. Different errors with chromosomes cause different abnormalities. The majority of these result in miscarriages within the first 3 months of pregnancy. There are diagnostic tests available in early pregnancy to reduce the risk of these abnormalities. Your local doctor will be able to provide you with information about these tests. The age of the woman is a very strong predictor of whether you will be successful or not. After the age or 32, fertility begins to fall and drops very quickly after the age of 40. Male partner age may also alter the chance of success. It is known that if you are over 36 and have not become pregnant after 6 months of trying, you should see your local doctor. The same applies for women under 36 who have been trying for 12 months without success. It is important to remember that fertility treatment is not a quick fix! 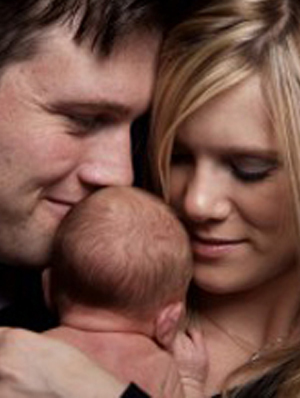 View our IVF success rates data. Please talk with your fertility specialist or nurse for figures based on your individual situation.